The container crane boom ropes 8×25 compacted construction wire rope has been manufactured with incredibly tight-knit strands. This makes it stronger, less likely to be damaged by abrasions and better able to battle bend fatigue. Ideal for use on container cranes. Breakages are simply not acceptable in any lifting context, let alone when heavy shipping containers are being handled in a docking environment or offshore. This is where the 8×25 strand configuration and the compacted after-treatment of our boom rope for container cranes come into play. There is little rotation resistance in this container crane boom ropes 8×25 compacted construction design, but that is not the point here; the aim is to deliver unquestionable strength and durability in a wire rope without increasing the diameter or weight. 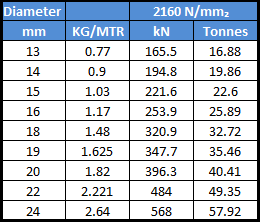 From 13mm to 24mm, and with breaking loads of 165.5kN to 568kN, this range is up to almost any task. Whatever length or specification of wire rope you require, we can make it to order and send it to you swiftly. 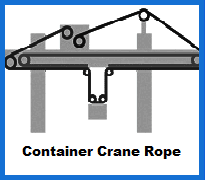 Our container crane ropes are a small part of what we offer. We also sell custom lifting slings, height safety equipment and everything in between. We can take your order for crane rope via phone or email. Our number is 01384 78004 and our team can take you through all you need to know about wire rope. Contact us online if this is preferable to a call. 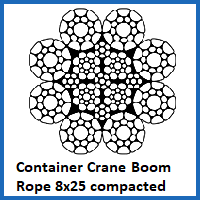 Container Crane Boom Ropes 8x25 Compacted Overall rating: 5 out of 5 based on 6 reviews.